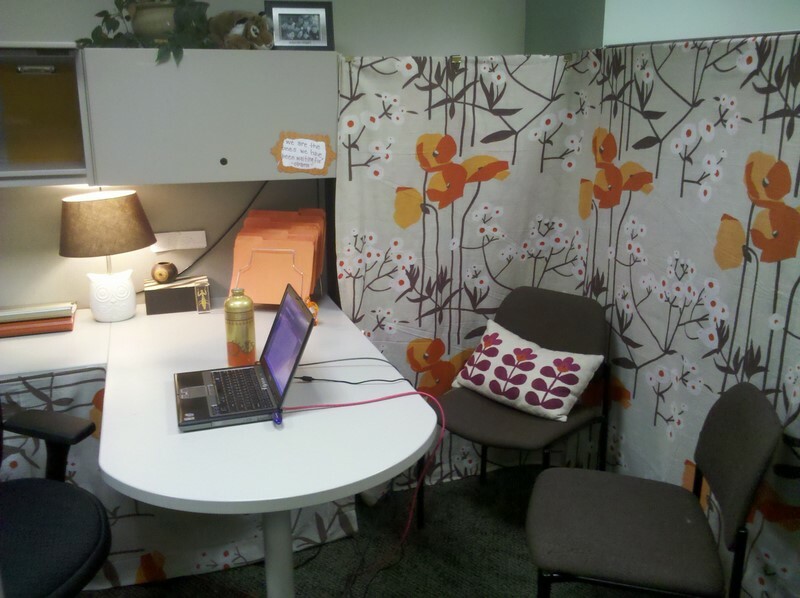 Jared Nielsen’s wood-lined, rug-bedecked cubicle. If you’re a cubicle aficionado like ourselves, you’ve no doubt already seen this “luxury cubicle” designed by software developer/artist/entrepreneur Jared Nielsen. With its dark cherry hardwood floors, paneling of rich mahogany, intricately carved desk and pint-sized Turkish rug it certainly mimics the uber-luxe suites we imagine our company CEOs sitting in between golf outings and three-scotch business lunches. While the cubicle makeover is clever and cute, it’s all so tiny that it reminds us of a doll house, which doesn’t actually scream luxury. Plus, poor Nielsen doesn’t even have enough room for all of his technology (he’s using a lap desk to hold his computer). A blogger over at Geekologie recently took some shots at Nielsen’s fancy cube, pointing out that the stain on his desk clashes with the walls and the floor. If you want to give your cubicle a luxurious makeover, there’s no need to start cutting up your grandma’s imported oriental rug or take a woodworking class. You can add classy touches that make your workspace more comfortable and aesthetically pleasing without making it act like something it’s not (namely the CEO’s office). Clean up your mess and then get organized by using stylish, coordinated desk accessories, of course. There’s nothing luxurious about stacks of paper clutter, coffee rings and dust bunnies. The first step to making your workplace look like a million bucks is to sort through all that buildup and start discarding what you don’t need, filing what you do and disinfecting as you go. Then start organizing. To help with this process, look for desk accessories that are both stylish and functional. We loved the color-coordinated desk pictured above; everything from trays to binders to the stapler to the pencil holder both serves a purpose and offers much-needed pops of color. As a result, the otherwise utilitarian office space looks clean, cozy and comfortable. There’s nothing the slightest bit attractive about fluorescent lighting, and for that matter it’s not all that great for doing desk work anyway. Adding supplemental lighting to your space can both up the style ante and save your eyesight. Skip the boring metal desk lamp you’ve used since elementary school, and opt for one with more character, color and class. We love the unique shape of the goldenrod-colored lamp pictured above, especially because it coordinates so well with the wall covering and framed art. Add interest to bland cubicle walls by using fabric, wallpaper or even wrapping paper. Just make sure to pick styles that aren’t too in your face. Just because your cubicle walls are covered in generic gray fabric with no personality, doesn’t mean they have to stay a generic gray fabric with no personality. There’s no reason you can’t cover them with a beautiful wallpaper, fabric or even wrapping paper. But remember, you’re going for high style, not cute, so steer clear of the loud, colorful or holiday-themed gift wrap and opt for designs you might use in your home (or that Beyonce would use in hers!). We thought the floral-themed wall-coverings used by this former office denizen offered just the right pop of color and print without looking too loud (plus we loved the throw pillow on the guest chair. What a great touch!). 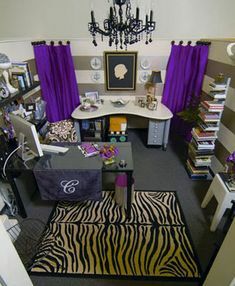 A zebra-print throw rug and a chandelier is all any cubicle needs to take it from blab to fab. Adding a couple tchotchkes or family photos is a nice way to add some non-work-related visual interest to your workspace, as long as you don’t go overboard. (And no, your collection of “Star Wars” bobbleheads does not count as a tasteful cubicle decor). A plant in a unique pot, a figurine or wall-hanging that makes you smile and inspires you, or framed artwork by your kids are all good options for making your cubicle more comfortable and beautiful. If you want to go a step further, a throw rug might add just the right touch. Start shopping for your perfect office at Arnolds.